With a spectacular string of hits, Mike Elizondo has steadily emerged as one of the most consistent hitmakers on the hip-hop, R&B and pop charts. Working primarily with hip-hop giant Dr. Dre, he has co-written & produced two of the biggest hits of the past two years, ‘In Da Club’ by 50 Cent, and Eminem’s new smash single, ‘Just Lose It.’ He also co-wrote the top hits ‘The Real Slim Shady’ by Eminem, ‘Let Me Blow Ya Mind’ by Eve (featuring Gwen Stefani), and ‘Family Affair’ by Mary J. Blige. Elizondo has co-written multiple cuts on several of the biggest-selling albums of the past five years. He co-wrote eight songs on the new Eminem album, Encore, six songs on the breakthrough Get Rich Or Die Tryin’ album by 50 Cent, four songs on The Eminem Show, and three songs on The Marshall Mathers LP. Elizondo has also co-written songs for many other, notable artists, including Jay-Z, Busta Rhymes, Snoop Dogg, D-12, Xzibit, Nate Dogg, Macy Gray, Nelly Furtado, Mandy Moore, Obie Trice, Warren G and Truth Hurts. Born and raised in Los Angeles, Elizondo learned how to play three, different instruments at a young age: piano (at age 9); tenor saxophone (age 12); and bass guitar (age 14). He would have jam sessions at his house with his father, who was a professional musician & songwriter. 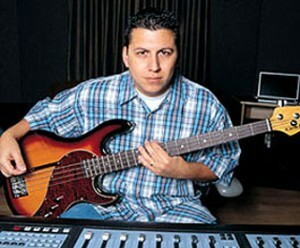 Then in high school, Elizondo formed several rock bands, for which he played bass and wrote songs. Following high school, he helped form and co-wrote songs (with producer Richard Wolf) for a R&B/rock band called Budahat, which was signed by Atlantic Records in 1995. ‘Getting a record deal was like Music Education 101 for me; I learned a lot about the record business and publishing,’ recalled Elizondo. It was in 1997 that Elizondo began writing with Atlantic artist, Poe. He co-wrote four songs for her second album, Haunted. Elizondo’s work with Poe led to him signing a publishing deal with producer Steve Lindsey, who had a co-venture deal with Windswept Pacific. ‘Steve was the one early on, who truly believed in my potential as a songwriter,’ said Elizondo. ‘[Dre & I] actually wrote the track six months before, but the artist we were working on at the time passed on it,’ recalled Elizondo. ‘But we felt strongly about the track, so we stashed it away until we played it for 50 (Cent). He loved it, and he fiercely started writing the lyrics. About an hour later, 50 had written the entire lyric. He came back in the room and started singing (the now famous intro) ‘Go Shorty, it’s your birthday, we’re gonna party like, it’s your birthday’.’ Notably, ‘In Da Club’ also turned out to be the first cut which Elizondo received a production credit with Dr. Dre. He is now credited as producer (with Dr. Dre) on all of their cuts together. After Get Rich Or Die Tryin’, Elizondo & Dr. Dre worked on other artist projects, including Mary J. Blige (the hit ‘Not Today’ (featuring Eve), which also appeared on the Barbershop 2 soundtrack album), Busta Rhymes, and Aftermath artist The Game (the single ‘Higha’). Separately. Elizondo collaborated with Macy Gray on two projects: a song for the 2004 Summer Olympics, and the theme song for the NBC-TV series, Miss Match. He also wrote a song with Doyle Bramhall, which Eric Clapton has recorded for his upcoming album. With the release and massive sales of Encore, and the success of the single ‘Just Lose It,’ Elizondo is continuing his tremendous run as both a hit writer & producer. It appears likely that his success story will continue for a long time. Currently, Elizondo is back in Los Angeles, collaborating with Dr. Dre on songs for 50 Cent’s highly anticipated, follow-up album. In addition, he is working on new projects as an independent producer & writer. Elizondo is developing two, promising artists, which he has signed to production deals.